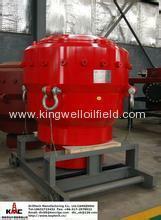 Annular blowout preventer is manipulated by hydraulic control system. When it is shut off, high pressure oil flows into piston underside closed cavity through the oil port in central shell, to push piston upwards, and the conical surface of piston squeezes rubber core. 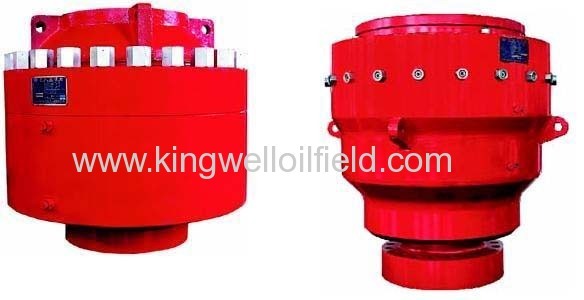 Due to the restrictions of head cover, rubber core can't go upwards but is pushed towards the center of wellhead until it enclasps drilling tool or enclose wellhead totally to shut the well. When well needs to be opened, manipulate the reversing valve of hydraulic control system, so that high pressure oil should flow into the open cavity on top of piston through the oil mouth on shell, to push piston downwards and decompress closed cavity, in which case, the extrusion force on the conical surface of rubber core is removed, and the rubber core is reset gradually with the action of its own elastic force to open wellhead. 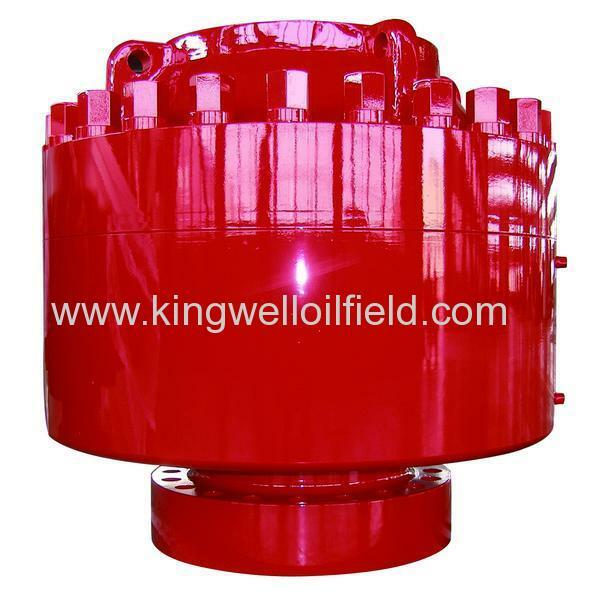 It's feasible to control wellhead with annular preventer firstly when blowout occurs in a well where there are drilling tools, but try not to seal it for long, because rubber core is fragile and there is no locking device. Don't close empty well with it in non-special cases. It's necessary to use a drilling tool with an 18-degree slope when annular preventer is used for snubbing tripping operation. Tripping speed should be slow when passing through joints, and all the rubber sleeves of the drilling tool should be uninstalled. When annular preventer is in an off state and shut-in pressure is below 5Mpa, it's feasible to move the drilling tool up and down, but don't rotate it. It's necessary to check whether the well is opened completely after it is opened every time lest rubber core be scraped. It's necessary to wash the inner cavity out to keep the switch flexible after well cementation and leaking stoppage, etc. Be sure to pay special attention to sealing backing ring and steel ring groove when installing or uninstalling annular preventer, which cannot be cracked up or scratched. After entering the target layer, try to shut in the well with drilling tool after tripping each time, to check how well the rubber core seal the well. It should be replaced at once if not up to standard. Make regular pressure test on the annular preventer according to relevant standards.